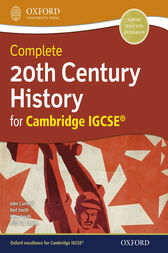 Written by experienced teachers and examiners, this comprehensive text is matched to the latest Cambridge syllabus. With a dual focus on knowledge acquisition iandr skills development, it includes extensive source analysis work and is packed with original colour sources, graphs and maps to hold learners' attention. A dedicated chapter on exam skills fully develops all the skills directly relevant to assessment and the alternative to coursework. Including carefulprovision for EAL learners, supporting online content, and extensive detail and challenge, it will stretch your most able students and enable critical thinking.